The finalists for the International Man Booker prize have been announced. Two names on the list have written wonderful books that have meant a lot to me. Amitav Gosh's In An Antique Land is a book I would place on my Ideal Egypt Reading List. I have just been searching my shelves for it and am distressed not to find it. This is a work of creative historical research and reconstruction and of deft and very amusing sociological observation. Gosh did doctoral research in two Nile Delta villages in the early 1980s (and then returned for a visit at the end of the decade). He memorably sketches the personalities of his hosts; his interactions with the villagers -- who mock him for his Hindu beliefs but call on him to fix their Indian-made water pumps -- are deeply funny. In his book he also imagines the life of a 12th century Jewish trader based in Egypt and his Indian slaves. He uses the Geniza documents, an incredible trove found in a Jewish synagogue in Cairo (since throwing away paper with God's name on it is forbidden, the Jewish community there had been using the space between two walls in the synagogue as a giant waste paper basket for centuries). To me In An Antique Land was a lovely, personal reflection on Egypt's layered, multi-cultural past and on its submersion (some would say erasure) by the modern nation state. It's told by a writer with great empathy, insight and intellectual curiosity about folks around him and ones who lived centuries ago. The Libyan writer Ibrahim Al Koni is also one of this year's list. 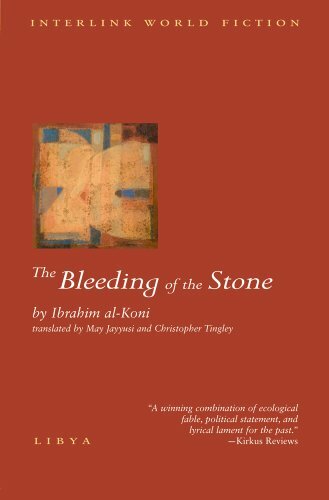 I read Al Koni's نزيف الحجر The Bleeding of the Stone when I was studying Arabic in Cairo in the Spring of 2008. A wonderful literature professor from Cairo University assigned it to us and it electrified the class. I have read a few more books of his in translation since, but none have struck me as much as this one. Like so many of al-Koni's books it takes place in the Libyan desert, where the writer is from. Taking the Twareg aspect of Al-Koni’s writing seriously allows us to recognize a radically redrawn map of the world—one in which the Sahara is a full, rather than empty space; one in which the Twareg lie not at the edges, but the center of history. Al-Koni’s novels take place in a desert world that is, despite its desolation, surprisingly rich in the sense that everywhere there are living beings struggling to live. In Al-Koni’s fiction, the meaning of life is always tied to struggle. Thus, Al-Koni’s novels paradoxically suggest that only here—in the harshest corners of the desert waste—does life emerge in its richest sense. While each of Al-Koni’s novels has a different focus, they invariably sketch a richly detailed Twareg landscape whose heart is located somewhere between Aïr and the Hamada Hamra, Ghadamès and Agadez, Sebha and Tamenrasset. Indeed, it is the Acacus range, Al-Koni’s birthplace, which forms the geographical center of this fictional universe. The inbetweenness of this geography is not accidental, for center of this world is deliberately situated between two diametrically opposing social and philosophical forces. To the South lies a world of myth, magic and superstition. It is the place where the caravans carrying blue cloth, slaves and gold originate. To the North lie the distant Arab cities of the coast and after that the sea—a place associated with mechanized technology and warfare. Truth emanates from neither—rather, it is in the struggle between them, the struggle in the Twareg center, that meaning is to be found. The protagonist is the lone, simple Asouf, a herdsman who lives deep in the desert, in precarious and often dangerous balance with nature. Then evil hunters -- who have already wiped out the gazelles of the area -- arrive, on a hunt for the waddan, a nearly mythical mouflon (a horned wild sheep) with whom Asouf has already had run-ins. Everything about the book is strange and unique: the setting (the Arabic novel is generally extremely urban, just think of the relationship between Mahfouz and Cairo); the agency given to animals (when a late chapter is told from the point of view of a gazelle we are hardly surprised); the unique spiritual universe in which imagery and symbolism from many different religions is combined. This is a world in which nature is cruel, but human are much crueler. The original Arabic is also beautiful. I can only speak to the laborious pleasure I got, sentence by sentence (the labour added to the pleasure -- reading in a second language is often very close reading), but Colla points out how it harks directly back to early Arabic literary tradition.